Gutters are an essential part of keeping your property protected from water damage. If working correctly and kept clean on a regular basis they can save you hundreds, if not thousands of pounds on expensive repairs. If your gutters become blocked then water will start to overflow down the walls of your building and even into the foundations at ground level. This can easily lead to dampness and eventually structural problems. In order to combat and prevent these types of problems occuring, Window Cleaning Services provide an effective and affordable gutter cleaning service using the very latest gutter vacuum system that will leave your property with clean, trouble free gutters. 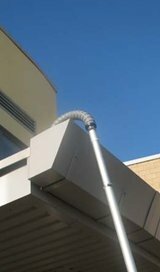 The latest Gutter Vac equipment we use is available to reach even high gutters up to 50 ft from the ground. This cleaning method is done safely from the ground and is fully compliant with the health and safety executive �working at height� regulations. Where necessary we can use our pole mounted camera to survey your gutters before and after cleaning to ensure they are cleaned properly. Being able to reach gutters high up means that we can clean gutters without the expense of using scaffold towers or cherry pickers, or risking injury from the use of ladders. We recommend maintaining your guttering on an annual basis to prevent any problems. If you would like a free quote on clearing or maintaining your gutters then please give us a call. We offer competitive rates and are fully insured.